Each glass holds 500ml. We will always help you to have a 100% positive happy buying experience. Great for parties. High Resolution Artwork. AC/DC Large Glass. - 500ml large glass. - approx 14cm tall. Mickeymow Top Deals. - in a display box. Premium Coloured Large Glass Individually Boxed 500ml Hand wash only. Glass tankard. Reads: Beer rations. East Of India. Size: 14 x 14cm (including handle). Circles of Love. Inspired by one of Britain's greatest sitcoms. Why Buy From Us. Yankee Candle. 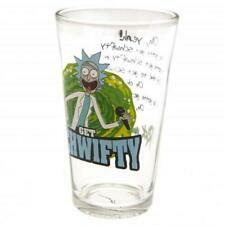 Rick And Morty Large Glass Schwifty. - 500ml large glass. - approx 14cm tall. Mickeymow Top Deals. - in a display box. Rick And Morty Premium Large Glass. - 500ml large glass. - approx 14cm tall. Mickeymow Top Deals. - in a display box. 4X ARC MADE IN FRANCE 0.5L PINT SIZE MUG FULLY TEMPERED GLASS BEER STEIN TANKARD Stunning Looking Glass Mugs. Approx 6" tall. From £7.16. Rick And Morty Premium Large Glass. 500ml large glass. approx 14cm tall. in a display box. official licensed product. . Guns N Roses Large Glass. - 500ml large glass. - approx 14cm tall. Mickeymow Top Deals. - in a display box. Rick And Morty Large Glass Schwifty. 500ml large glass. approx 14cm tall. in a display box. official licensed product. .
Country/Region of Manufacture Unknown. Glassware Type Beer Glass. Material Glass. We PROMISE we can make you happy if you give us a fair chance. Color Clear/Multi. Set of 4 Retro Sapm Pint Glasses. Type Pint Glass. M&J Variety. Made of Luxion crystallite. We go above and beyond to ensure you receive the best level of service. 500ml large glass. - approx 14cm tall. 500ml capacity. Printed Glass. Thick glass. Rick And Morty Large Glass. - 500ml large glass. - approx 14cm tall. Mickeymow Top Deals. - in a display box. The Beatles Large Glass Apple Logo. - 500ml large glass. - approx 14cm tall. Mickeymow Top Deals. - in a display box.